I made this felt campfire for my son on his 5th birthday and he loves it! Not only is it a great toy, but I put it in my empty fireplace when he is not using it and it looks so cute! 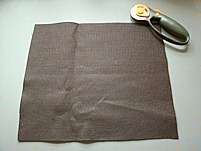 Felt is such an inexpensive product which makes this a great cheap gift idea. 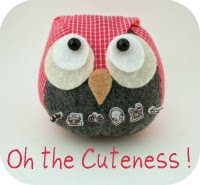 This would make a great homemade Christmas gift or birthday present for a child. Below is a picture tutorial for making this felt campfire. Feel free to make as many as you want to give away as gifts. Please read my picture and pattern use policy for information on picture and pattern use. You will need to measure and cut out 3, 12 in. by 11 in. pieces of brown felt for your logs. Fold the pieces in half and pin. I made 2 sewn along the 12 in. 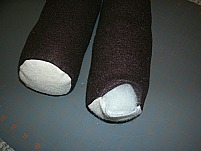 sides and 1 sewn along the 11 in. to give a little difference in the logs. 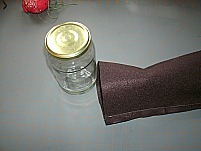 You can stick a jar about the size of the log to keep it's shape for tracing. 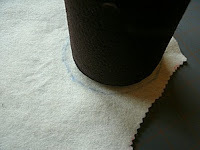 You will need to trace two ends for each log with your white felt. 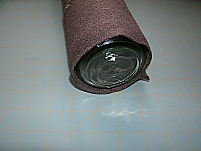 To get an accurate size for the ends, insert a jar that fits somewhat snugly into the log. Cut out the ends. 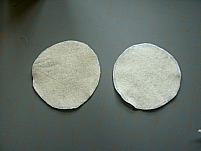 Now here you could cut 4 pieces of cardboard slightly smaller then the white circles to give you log more shape. Just make sure to stick them in before you stuff and sew. Take your log ends and pin them to the ends of the log. You will need to leave a 2 in. space to turn the log right side out on one side of the log. I place a pin horizontally on each side of the two in. space so I remember. 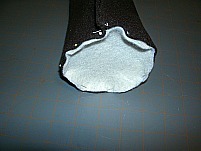 Sew around the ends of the log with a 1/4 in. hem. Pull the log right side out through the 2 in. space you left on one side. Stuff your logs and sew the 2 in. space closed with brown thread. It is best to do this by hand. Make 3 logs using these steps. You will need to make 2 yellow flames for the inside of the flame. Fold over 3 inches of yellow fabric. In the 3 in. space, draw a small flame (about 3 inches high). You can pin the fabric together to hold it tight. Cut out the flames. 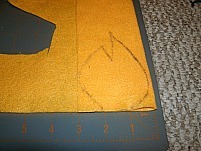 With the orange felt, mark 6 inches and draw a flame within the 6 in. space. You can place the yellow flame in the center to help guide you. Fold fabric over, pin, and cut out. Pin the yellow flame in the center of the orange flame. 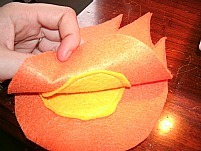 Sew the yellow flame onto the orange flame. Do this to both sides of the flame. 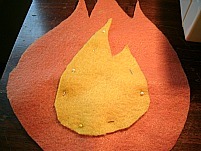 Pin the right sides of the flames together (the side with the yellow flame being the right side). Leave the bottom of the flame open. This will be where you turn it right side out. 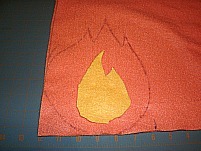 Sew the flames together leaving about a 1/4 hem. 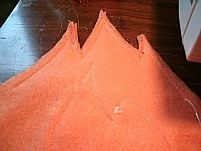 Carefully clip the tops and corners of the flames, getting as close as you can to where you have sewn without cutting through it. This will help the flames have pointy edges. Now turn the flame right side out. Stuff with stuffing starting with the tips of the flames. You can use a crochet needle or the bottom of a pencil to jam the stuffing up in there. That way the points stick out nicely. On the bottom of the flame where you left the space you will want to fold both sides in about a 1/4 in. 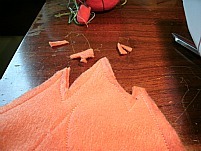 and hand sew together with orange thread. Make one more flame, just make the orange part 8 inches wide instead of 6. The rest of the instructions are the same. 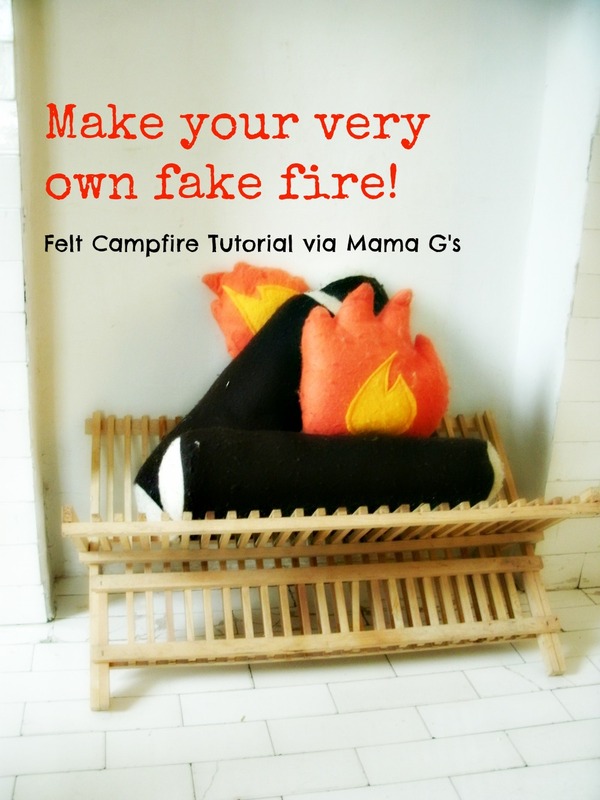 I went searching for a free felt s'more pattern but came up empty handed. I am sure are quite a few out there so I will keep looking. Do you guys know of a good one? Please leave a comment if you do!